A protest against the murder of a young man in Moscow’s Biryulyovo district turned violent Sunday night with crowds overturning cars and looting a shopping center. Moscow riot police faced off against an angry crowd in the Biryulyovo district of southern Moscow on Sunday night. The rioting began when protesters participating in an unauthorized rally headed towards an apartment building where Yegor Shcherbakov, a young man killed a few days ago, had lived. 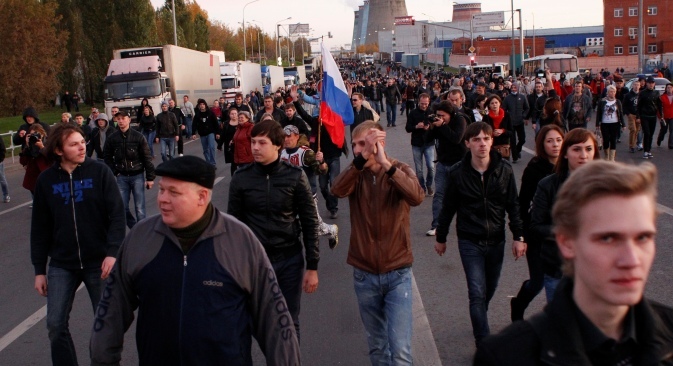 A second group of protesters moved to the local vegetable warehouse, chanting nationalistic slogans, saying they wanted to force Shcherbakov’s murderer out of the vegetable warehouse where he was said to be hiding. The first group of protestors proceeded to erect barricades outside a local shopping center. The protestors overturned at least one car and threw a flare into the shopping center, causing the first floor to fill with smoke. Riot police closed the roads leading to the area and formed a human chain around the vegetable market to deflect people from entering the area. Initial estimates show that around 3,000 people were involved in the conflict. Shcherbakov was killed on Oct. 9 while trying to defend his girlfriend from an assailant who approached them with a knife. The Russian Investigative Committee reported on Sunday that Shcherbakov’s murder had been referred to the Investigative Committee's Department for Investigating Grave Crimes. "Eyewitnesses have been questioned. Police are searching for the assailant. The search is continuing," the Investigative Committee said. The entire police force of the city of Moscow has been put on high alert and Manezh Square outside the Kremlin has been closed. The square has traditionally been a popular place for protestors. ITAR-TASS has reported that Russian Interior Minister Vladimir Kolokoltsevis holding an emergency meeting in connection the incident. Yelena Kokotova, the acting spokeswoman for the Moscow Police, said that in addition to Kolokoltsev, Interior Minister Vladimir Kolokoltsev and Moscow police chief, Anatoly Yakunin are taking part in the meeting. Kokotova also said that some riot policemen had sought medical assistance. Fights have also broken out between protestors and migrant workers due to rumors that Shcherbakov's murderer was a migrant. Lyudmila Alexeyeva, head of the Moscow Helsinki Group, issued a statement reacting to the assaults on migrants. "People must be calmed down, an operation to find the killer must be conducted and street violence must be prevented," she told Interfax on Sunday. “What alarmed me is that people see non-Russians as the root of all troubles. Moscow is the capital city of a multiethnic state. It must be a multi-ethnic city by definition. The Russian Migrants Federation has urged representatives of ethnic communities to remain on alert in the wake of disturbances in southern Moscow. He said the Moscow police are taking effective measures to bring the situation back to normal. So far 200 people have been detained in the Biryulyovo area and 60 in northeastern Moscow. This story is based on reporting from Interfax, ITAR-TASS and Business New Europe.